Aletopelta is one of the more tantalizingly enigmatic ankylosaurs from North America. It’s from a weird place – California – which may have been much further south 75 million years ago compared to its current position. It was also found in marine sediments, and the decaying carcass had formed a little reef, with oysters encrusting the ribs. 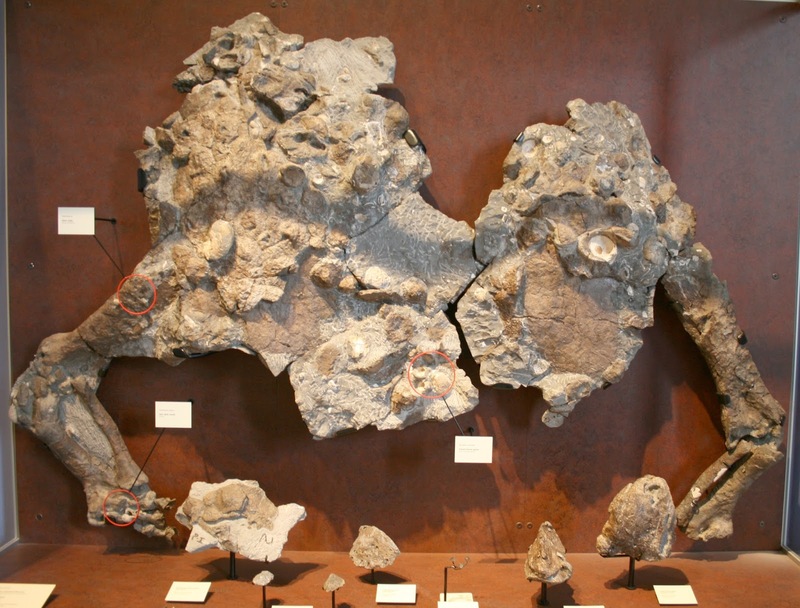 The only known specimen of Aletopelta is relatively complete, all things considered, with the osteoderms in situ over part of the pelvis, the legs partially articulated, and with various odds and ends like osteoderms and vertebrae. Unfortunately, the ends of the bones are often chewed apart, and some of the material is a bit hard to interpret. Here’s the articulated pelvis and hindlimbs, and some other armour pieces, on display at the San Diego Museum of Natural History. Regardless, Aletopelta is a very interesting ankylosaur. It has an unusual osteoderm morphology over the pelvis, with small hexagonal osteoderms closely appressed to each other. Ankylosaur pelvic armour seems to come in two major flavours: fused rosettes, like we saw in Dongyangopelta and Taohelong (and perhaps most famously in Polacanthus), and interlocking hexagons, like in Stegopelta, Glyptodontopelta, and Aletopelta. Tracy Ford suggested that ankylosaurs with these hexagonal pelvic shields might represent a clade (dubbed Stegopeltinae) of ankylosaurids. Glyptodontopelta has since typically been interpreted as a nodosaurid, as has Stegopelta, but the most recent interpretation of Aletopelta was that it was an ankylosaurid. In the revised phylogeny in my new paper, we found Stegopelta and Glyptodontopelta as nodosaurids, but Aletopelta as a very basal ankylosaurid. However, although Ford and Kirkland reconstructed Aletopelta with the typical ankylosaurid tail club, I don’t think that it possessed one: the preserved distal caudal vertebrae don’t show any of the lengthening or other modifications that are characteristic of ankylosaurid handle vertebrae. An updated restoration of the known elements in Aletopelta – the main differences between this and Ford and Kirkland’s reconstruction are the absence of a tail club, and uncertainty over what the head should look like. Cedarpelta is an important taxon for understanding the biogeography and evolution of ankylosaurids, and I wish we had more specimens! I don’t have many new comments to add about this taxon, since Ken Carpenter published a great description of the disarticulated skull back in 2001. Cedarpelta has been interpreted as a shamosaurine ankylosaur, as a relative of taxa like Gobisaurus and Shamosaurus (which I’ll talk about in the next post) from Asia, and thus may point towards a mid Cretaceous faunal interchange between these two continents. In our revised phylogenetic analysis, we didn’t find Cedarpelta as the sister taxon to either Gobisaurus or Shamosaurus, but it does come out as a basal ankylosaurid in their general neighbourhood, and I honestly wouldn’t be surprised if future analyses or new taxa show support for it as a shamosaurine ankylosaur after all. Nodocephalosaurus! What a fun ankylosaur. It’s really quite unlike the other ankylosaurids from North America, which typically have flat, hexagonal cranial ornamentation. Instead, Nodocephalosaurus has bulbous, conical cranial ornamentation. Bulbous cranial ornamentation is typical of Campanian-Maastrichtian Mongolian ankylosaurs like Saichania and Tarchia, but in those taxa the ornamentation is pyramidal rather than conical. The front end of the snout in Nodocephalosaurus is also unusual, because there’s no obvious narial opening and instead the ornamentation has a stepped appearance. Hopefully better specimens with more complete snouts will resolve this weird morphology. I’ve also reinterpreted the position of the quadratojugal horn compared to Sullivan’s original figures – the horn should be rotated forward so that the bottom margin of the orbit is complete. Nodocephalosaurus holotype skull in dorsal and left lateral views. I don’t have much to say about Tatankacephalus because I didn’t look at the original material myself, but the previous phylogenetic analysis by Thompson et al. recovered it as a nodosaurid rather than an ankylosaurid as originally suggested by Parsons and Parsons, and we found the same result. Overall, Tatankacephalus is VERY similar to Sauropelta, so this is perhaps not surprising. Up next: More odds and ends, but after I return from Utah! Aletopelta has distal caudal vertebrae? I haven't seen any, in fact, I've barely seen any vertebrae from Aletopelta. Distal caudal vertebrae or distal caudal osteoderms? There's a block with some distal caudals embedded in it that you can see from both sides, which also has some associated osteoderms. There's also a partial dorsal vertebra (in not really great condition).